BANNING Mosques Will Strangle Islam’s (Western) Choke-hold: Step-By Step. AT the onset, it is imperative to identify bugaboos within hot-button issues. Assuredly, little more qualifies than the “religion of peace.” Besides, failure to do so affords the jihadi enemy open sesame. This is the case, be it through one or another shuck and jive show or through frontal jihad. Regardless, the deadly truth is either obfuscated or a done deal. RESULTANT, when basic freedoms are at stake, elephants in the room must be targeted. No doubt, freedom of religion (alongside freedom of speech and expression) qualifies as key and core. IN this regard, the first order of business is to shout from the rooftops: Islam has long ceased to be a religion, per se, therefore, it is not entitled to western protection!! Rather, it is a political/ideological weapon utilized as a spearhead into the west – the end goal being the resurrection of the next Caliphate. Effectively, there is no separation between so-called “moderate” Islam and radical Islam – it is one and the same, despite all the apologias and verbal diarrhea to the contrary. AS such, the following evidentiary trail (among enumerable found at this site, with re-blogs circling the web like a house on fire) must be used as supportive evidence, thereby, leading to the only rational conclusion: BANNING mosques will save the west from Islam; that which is supposedly dictated by Allah, as “revealed” by their madman “prophet”, Muhammad! Period. David Gaubatz is the author of a book about the Council on American–Islamic Relations and the Islamic infiltration of America, Muslim Mafia: Inside the Secret Underworld That’s Conspiring to Islamize America. Gaubatz is a U.S. State Department-trained Arabic linguist and a retired Federal Agent with the U.S. Air Force Office of Special Investigations (AFOSI). With over three decades of combined experience, his career has led him on missions spanning the Middle East — from Saudi Arabia, Jordan, and Kuwait to Iraq. As a Special Federal Agent, he has received the highest forms of U.S. security clearances for top-secret intelligence information — including for weapons of mass destruction and espionage — and has been briefed into many black projects. Wolff Bachner: You are the inspiration and brains behind a rather important program called The Mapping Shariah Project. What exactly is The Mapping Shariah Project? What have you uncovered about Islamic extremism being promoted in American Mosques, and what materials have you collected to document this unlawful, dangerous activity? David Gaubatz: In 2007 – 2008, I was hired to be the Director of the Mapping Shariah Project (MSP). The project was funded by the Center for Security Policy and David Yerushalmi (attorney) handled the legal issues. We had PHD level professionals in Israel (Professor Mordechai Kedar) to analyze the data. The essence of the research was for me to send teams to a couple hundred mosques throughout America and observe the Shariah adherence by the Islamic leaders and the Muslim worshippers. The theory was the more adherence to all aspects of Shariah law, the more likelihood the danger of violence (Physical Jihad). This was proved in the research. We discovered over 75% of the 2300 mosques in America had violent Islamic material within the mosque. Most of the material was from Saudi Arabia and Pakistan. ALAS, as we head into November 2017 (three years since the above blockbuster interview at Inquisitr was given) the situation in America (throughout the west at large) has gone from one level of red hot to the highest decibel alarm. Ignore these warnings at your own peril. SO, once the truth sinks in, mandatory dismantling of Islam’s barracks will become crystal clear – the leadership’s objections be damned. If necessary, brick by brick. Concomitantly, it will be obligatory for all patriots within the U.S. and Israel (the twin pillars of western civilization) to follow the 2009 “Swiss (minaret) template”, but on steroids! We will get to that. MIND you, there is no “love lost” at this end for Switzerland; a so-called “neutral” nation during the horrors of the Holocaust, but let’s not digress. After all, even a broken (Swiss) clock can get it right once in a while! First Switzerland banned (in 2009) the addition of sky-high minarets and their loud speakers on mosques, then they banned burqas and face-covering veils in public places. Now (Oct. 2017) Swiss legislators are planning to ban Arabic from being spoken by imams in mosques and will prohibit any foreign funding for new construction or renovation of mosques. 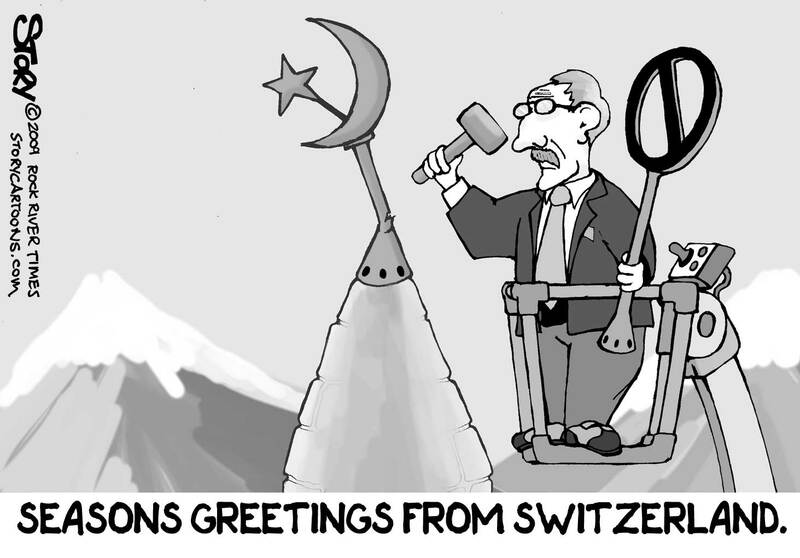 Swiss policies and limited Muslim immigration are one of the reasons there have been no Islamic terrorist attacks there. Yet. ALL of which leads from there to here…..
TO wit, kudos are extended to Swedish patriots and their leaders for taking front-line steps to curb the Islamic menace – protecting their culture from Muslim supremacists and an eventual onslaught. For starters, in 2009, they banned minarets. Thereafter, they silenced their calls to jihad over mosque loudspeakers. Next up, in 2014, they outlawed burqas. Most recently, they limited Muslim immigration, and imposed a legislative ban re funding and renovation of new mosques. Still yet, there is much more which must be done. ALAS, wouldn’t it be rational for America – as the foremost nation of the free world – to lead the way, thus, freeing the west from Islam’s death-grip? CONSEQUENTLY, shuttering all mosques becomes a national imperative. Naturally, de-funding all those in the planning stages will follow. 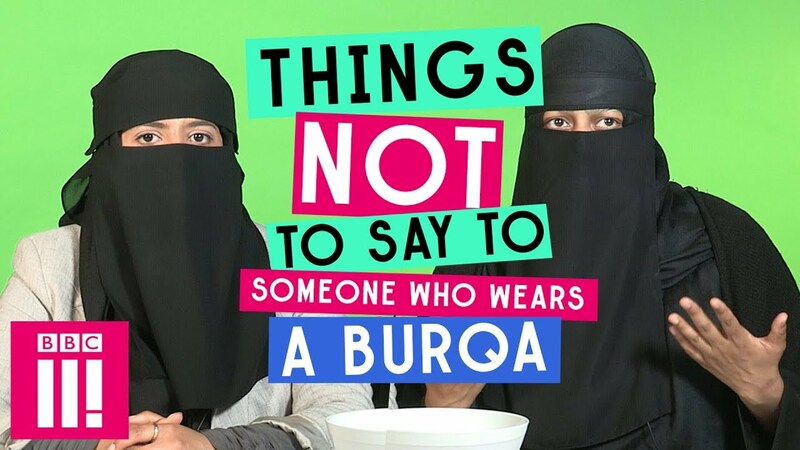 STILL yet, if patriots prefer to start with their Islamic garb….burqas…head-bags….as opposed to their barracks – peer within. Quebec has adopted a law that will force people to show their faces when taking the bus or borrowing a book from the library, pushing ahead with legislation that is being criticized for targeting Muslim Canadian women. Bill 62, which the Justice Minister described as a North American first, requires one’s face to be uncovered when giving or receiving public services. The law marks the outcome of a contentious, decade-long debate about the place of religious minorities in Quebec. INDEED, the above is just the tip. IN furtherance to the imperatives at hand, the overriding question becomes: What exactly has Switzerland’s “pro-active template” done to protect its non-Islamic citizens? Well, while there has been an uptick in threats against Switzerland over the past few years, the fact remains that “death by jihad” has been slim to none since Feb. 21, 1970 – when the PFLP, the Marxist arm of Palestinian terror, executed the bombing of Swissair flight 330! MOST significantly, by acting as a normal and rational country (responding to public demands and seeing from there to here), Sweden’s prior tactics have led to tightened up anti-terrorism laws in 2016 – that which enable leaders to strip convicted terrorists of their citizenship, as well as others who return home from jihadi hotbeds. Imagine that. CONCRETELY, unlike in America where mega mosques are imposed upon non-Muslim populations and radical imams preach jihad within, at least the Swiss have the requisite common sense to shutter radical doors! NOW, does anyone really believe that without HEAVY pressure from its non-Muslim population that Sweden’s leadership would have enacted its toughened anti-Islamic actions? Not only that, what about the jihadi-infested An’Nur mosque in Winterthur and its shuttering? How coincidental is it that it is currently “out of business” during this very same anti-Islamic thrust? Do pigs fly? DEMONSTRABLY, for a highly placid-like nation, the Swiss are running circles around American patriots in the arena of self-survival – and that’s a real crying shame! An embarrassment to boot. CONCLUSIVELY, it has been proven six ways to Sunday: whenever basic freedoms are granted to followers of Islam, the rate of blow back via jihad – frontal or stealth aka civilizational – increases exponentially. This is the case because countless westerners fail to internalize an inherent truth: there is NO concept of democracy in Islam, and anything smacking of it is deemed forbidden – haram …. حَرَام‎‎ . That is that. Yes, Sharia Law is above Constitutional Law, and their differences are irreconcilable. Deadly so. OMINOUSLY, an overwhelming majority of Muslims in America (especially, those who attend this or that mosque) are similarly inclined – disquieting as it is. The point being, if the Muslim population ever gains the upper hand, rest assured, Sharia Law will become the law of the land. Guaranteed. SO, it is along the very same trajectory that this jihadi expert implores patriots to examine the aforementioned MappingSharia.com – which happens to be cited above. Besides, it makes no sense to look a gift toss in the mouth, so to speak. After all, it is this site’s gift to fellow patriots – free of charge! INCONTESTABLY, step-by-step, SHUTTERING MOSQUES will lead to the ultimate safety valve for the west – BANNING THE CULT OF ISLAM! !